During 15-16 June 2017, ESRF was hosting the European-Russian CREMLIN Workshop on “Funding and Joint Research Programmes at the Megascience Facilities”. This workshop was held back-to-back with the third CREMLIN Consortium board meeting. 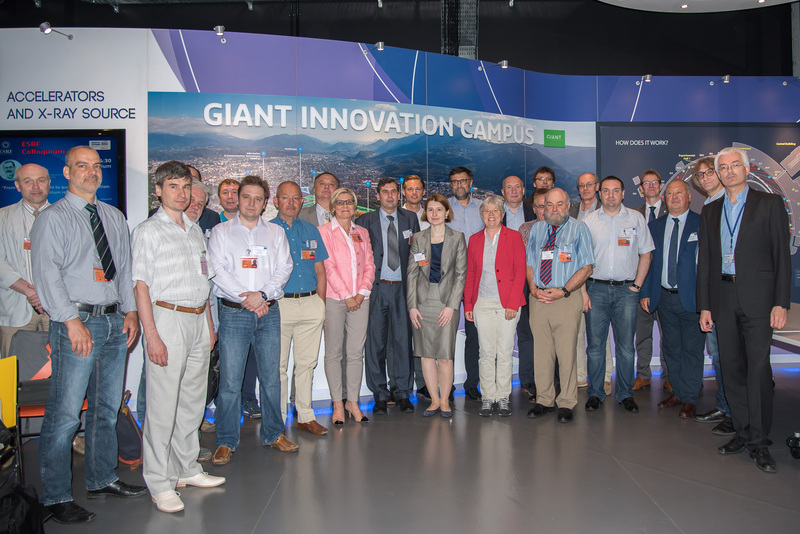 More than 30 representatives and experts from European and Russian megascience labs came to Grenoble in order to discuss the topic of funding and joint research programmes with a focus on European-Russian collaboration in the context of Megascience facilities. A tour through the facilities at ILL and at ESRF rounded off this CREMLIN event. The overarching theme of this workshop was related to targeted funding programmes aiming to support and to coordinate in a most effective way the use of research infrastructures – either on a national level or in bi- or multilateral collaborations. The concrete workshop goals were to address funding schemes between EU or individual members states and the Russian Federation around the new megascience facilities and to identify and share good practice for mutual learning. After the welcome address by Harald Reichert (ESRF Director of Research), Frank Lehner (DESY) and Mikhail Popov (NRC KI) pointed out the goals of the workshop. The Key note speech was given by Carlo Rizzuto (ERF; ELI-DC). Jean Moulin (Honorary General Advisor to the Belgian Science Policy Office) gave an introductory talk into the general theme, into good practice and into the major challenges. He pointed out in detail the current TNA programmes (“Transnational access”) under Horizon 2020 by explaining in particular the funding scheme “Integrating Activities” – which is also relevant for the European-Russian collaboration. During the workshop the issue of funding was addressed at different levels: funding schemes and programmes at the national level, at the bilateral level and at the multilateral level. Learning from good practice: What funding mechanisms and schemes have proven most successful in Europe to utilize European RI in a most effective way? How to set up, implement and monitor coordinated and joint programmes at an EU-Russian or bilateral level? How can European researchers be best mobilized to exploit Russian megascience facilities and vice versa? All participants agreed that it becomes more and more necessary to think about and develop new and improved access support tools and schemes to stimulate and facilitate access of both national and international users to European and Russian research infrastructures – existing infrastructures, as well as upcoming infrastructures, such as the European XFEL or the PIK facility. All participants enjoyed a splendid and excellent hospitality at the ESRF and ILL premises and thanked the organizers enthusiastically.